Kemmel Churchyard is located 8 km south west of Ieper town centre on a road leading from the Kemmelseweg (N331), connecting Ieper to Kemmel. From Ieper town centre the Kemmelseweg is reached via the Rijselsestraat, through the Lille Gate (Rijselpoort) and straight on towards Armentieres (N336). 900 metres after the crossroads is the right hand turning onto the Kemmelseweg. (Made prominent by a railway level crossing). On reaching the village of Kemmel the first right hand turning leads onto the Reningelststraat. 600 metres along the Reningelststraat lies the church and churchyard of Kemmel. The village of Kemmel was near the front line during the greater part of the War, and in enemy hands in the summer of 1918; it contains several British cemeteries. The Churchyard was used for British burials from October, 1914, to March, 1915. 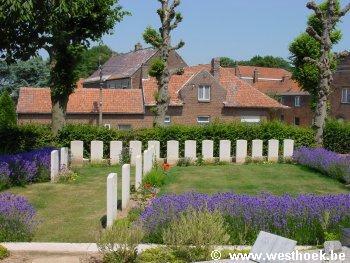 There are now over 20, 1914-18 war casualties commemorated in this site. Of these, a small number are unidentified and the graves of fifteen, destroyed by shell fire, are represented by special memorials.